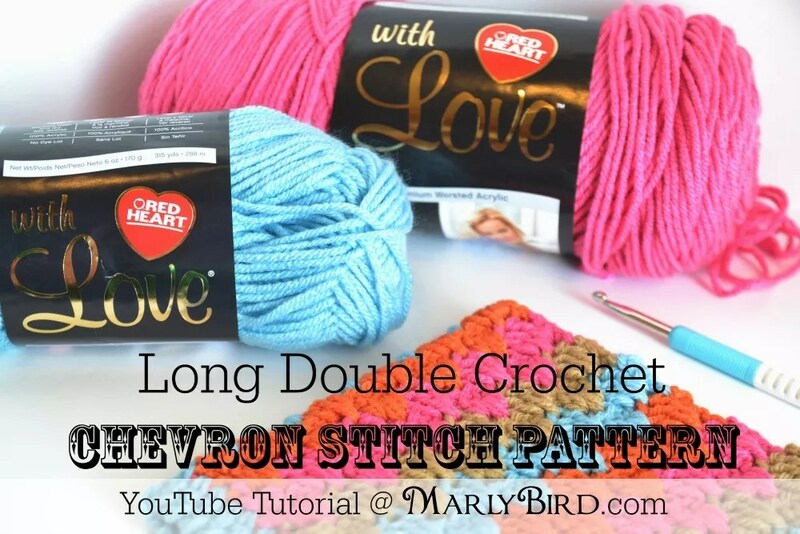 The long double crochet chevron stitch pattern is a fun pattern that is easy to follow, reversible and perfect for men, women, boys and girls. The great part about this stitch pattern is that you can get a completely different look if you decide to use one color throughout, change colors every two rows, or change colors every row! What makes this pattern look so unique is the placement of the stitches which gives the illusion of a chevron. The long double crochet stitch (Ldc) is made in the row below and a double crochet stitch is worked into the space on either side of the Ldc. This might seem confusing but once you see it in the HD YouTube Video Tutorial I’ve done for you it will be a piece of cake! 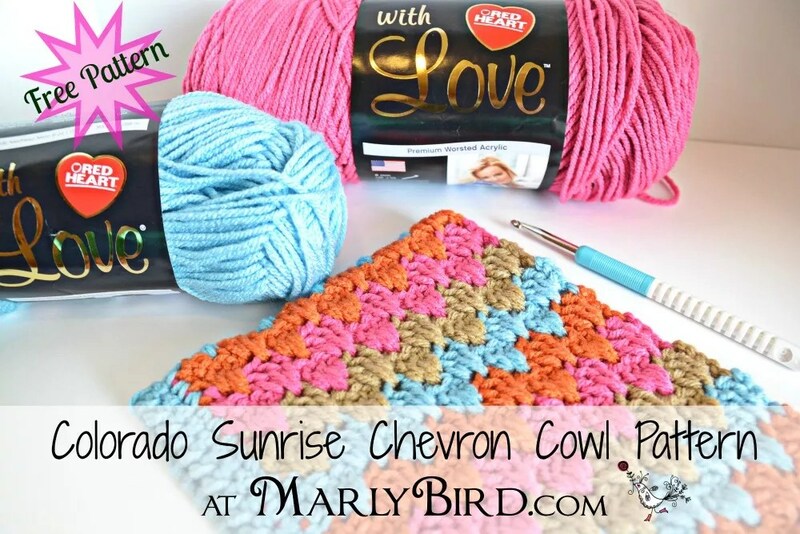 In the crochet Long Double Crochet Chevron Stitch Pattern video I teach you how to do this fun new stitch that can be used in any accessory or garment. As a matter of fact, I’ve already done a super cute cowl pattern using this stitch pattern that I want to offer to you for FREE! 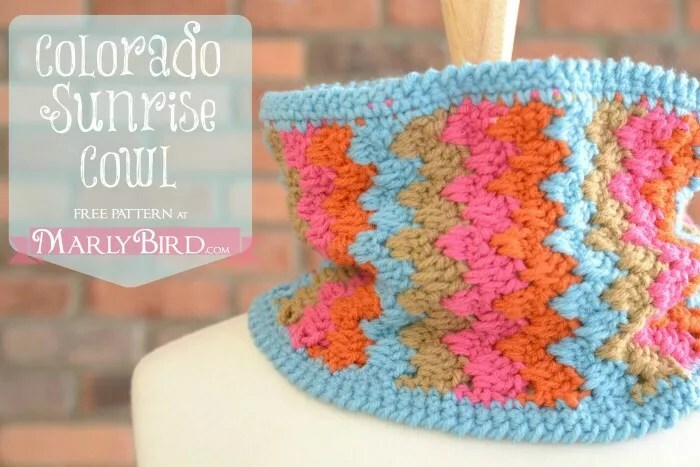 It is called the Colorado Sunrise Cowl and you can find the pattern here. Any yarn will work for this project. To get the chevron look use at least two colors. The sample in the video is made using Red Heart, “With Love” (100% acrylic, 315 yds/170g) — Order this yarn online today! To complete this stitch pattern you will need to chain a multiple of 4 chains. The sample in the video used 12 chains (ch). Foundation Row 1: 3 double crochet (dc) in fourth ch from hook (3 skipped chs count as the first dc), *skip next 3 chs, 3 dc in next ch; rep from * to last 3 chs, dc in last ch. Row 2: Ch 3 (counts as first dc), turn; dc in space (sp) before the next 3-dc group [this stitch will be to the right of the next stitch you make], long double crochet (Ldc) in center skipped st one row below, dc in same sp before 30 dc group [this stitch will be to the left of the stitch you just made], *skip 3-dc group, dc in sp before next 3-dc, Ldc in in center skipped st one row below, dc in same sp before 3-dc group; rep from * across to last 4 dc, skip next 3-dc, dc in last dc. Finish off your work here and rejoin with a new color using a standing double crochet. This method will create a tail for each color change that will need to be tucked in when finished. You can change color to second color on last stitch of row, cut the old color and when it is time to rejoin with a new color repeat the process. This method will create a tail each color change that will need to be tucked in when finished. You can change color to second color on last stitch of row, leave the old color hanging out and when it is time to rejoin with a new color float the old color up the side of the work to use it. Then continue on in pattern leaving the new old color just hanging out. This is my preferred method and it is the one I show you in the youtube video. This method will create a float at each color change along the side that can be hidden with a little trim. Once you’ve decided how you will change colors you carry on in pattern which is SUPER SIMPLE! The next rows are almost exactly like row 2 with the only exception being that instead of working into the skipped ch from the row below you will work into the center dc of the 3-dc group in the row below. Next 2 rows: Ch 3 (counts as first dc), turn; dc in space (sp) before the next 3-dc group [this stitch will be to the right of the next stitch you make], long double crochet (Ldc) in center dc of 3-dc group one row below, dc in same sp before 30 dc group [this stitch will be to the left of the stitch you just made], *skip 3-dc group, dc in sp before next 3-dc, Ldc in in center dc of 3-dc group one row below, dc in same sp before 3-dc group; rep from * across to last 4 dc, skip next 3-dc, dc in last dc. TIP: Since you are using two colors for this swatch the opposite color of yarn will be waiting for you at one end signalling that it is time to change colors. You can carry the yarn up the side creating floats, or cut the yarn color each time and join a new ball of yarn. Repeat the last two rows for the Long Double Crochet Chevron Stitch Pattern.